NX has created the bottle valve against which all others will be judged. 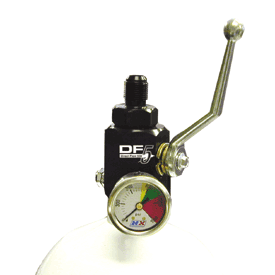 The "Direct Flow 500", equipped with .500 orifice and a direct flow, straight through design, is capable of flowing over 2,000 nitrous horsepower. Furnished with a .625 stainless steel siphon tube, all D-8 hardware, supply line, fittings and a liquid filled N2O pressure gauge.